Palomino is a beach town on Colombia’s northern Caribbean coast that has turned into a popular tourist destination, especially among backpackers. Sporting a laid back and hipster vibe, it is a nice stop on a tour of Colombia’s northern coast. In this travel guide to Palomino, you will learn how to get there, accommodations, and what to do in Palomino. The Palomino River. Tubing down the river is one of the top things to do in Palomino. Read on for a complete travel guide to Palomino. 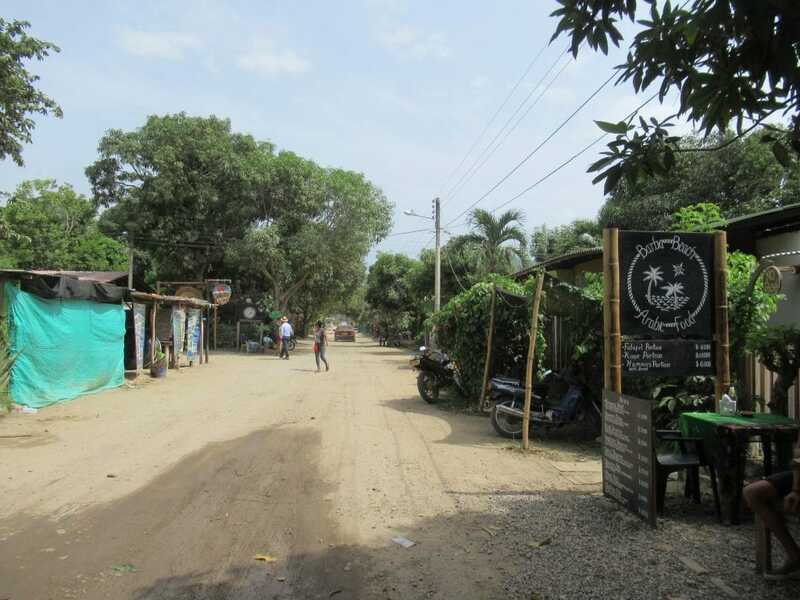 Located about an hour and a half north of Santa Marta, Palomino is a cool and relaxed place to hang out for a few days by the beach, meet some fellow travelers, enjoy some chilled out nightlife, and eat some good grub. It is also the gateway to explore more of Colombia’s La Guajira Peninsula. We stopped at Palomino for two nights in July 2018 on our way back from Punta Gallinas. It was a nice respite from the more roughing it style of travel we did there and in Cabo de la Vela. See also: Travel Guides to Cabo de la Vela and Punta Gallinas. Honestly, despite being here in Colombia since 2011, I had not even heard of Palomino until fairly recently. While I’ve seen descriptions from other blogs online describing it as undiscovered, there was a decent crowd when we were there, so it’s clearly firmly on the map. It seemed to me that Palomino has replaced Taganga as a nice stop off point for backpackers, and it reminded me quite a bit of the vibes in Taganga a few years back, basically a quiet beach town that has been turned into a tourist destination with a proliferation of trendy hostels and restaurants/cafes/bars. While there are prettier beaches on Colombia’s Caribbean coast, Palomino’s laid-back vibe and cafes make for a nice happy medium between the city and nature. It is the perfect place to stop and chill out if you are going to or coming from Tayrona National Park or La Guajira. Below, I will give you a run down of our visit. In this travel guide to Palomino, you will learn how to get there, available accommodations, and what to do in Palomino, Colombia. Another shot of the Palomino River. 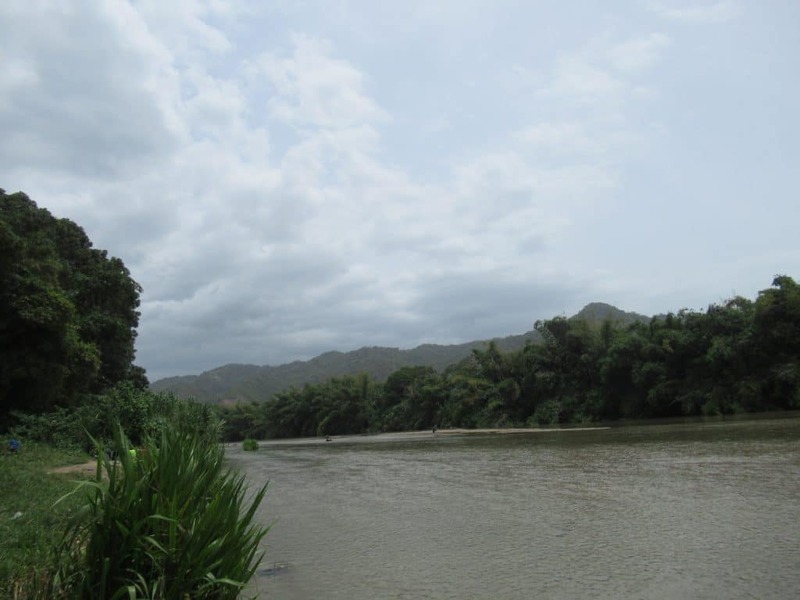 The gorgeous scenery is one of the main attractions in Palomino. 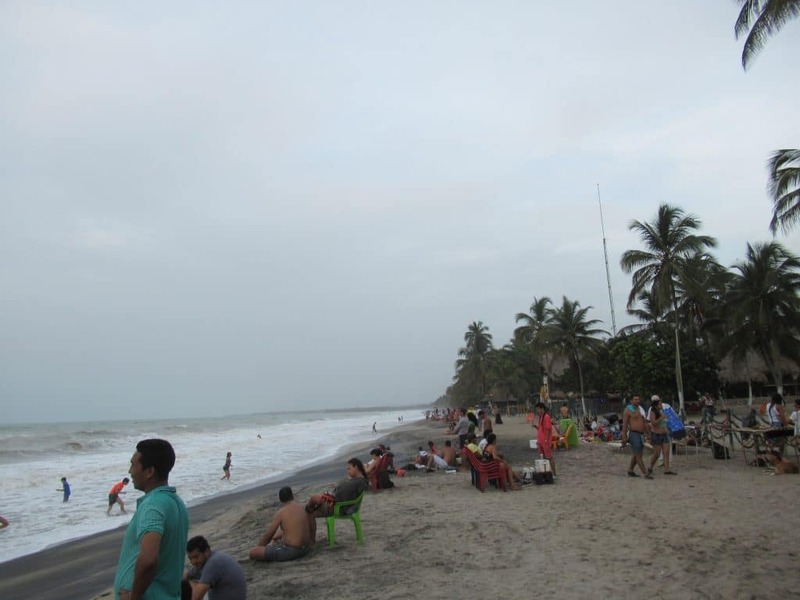 You can reach Palomino by bus from Santa Marta or Riohacha. You should pay approximately 10,000 pesos to get there and you can get buses from the terminals in either city or from the market in Santa Marta. Marsol also offers charter van service to Palomino and can be taken from Cartagena, Barranquilla, or Santa Marta. Cost will depend on where you get the van. To get from Tayrona to Palomino, you can catch a bus headed north along the road outside the main entrance to the park. From elsewhere, I’m not sure if there are buses directly to Palomino from other cities in Colombia, so you will most likely have to bus into Santa Marta, then hop the bus to Palomino. Check out bus routes, times, and prices at www.redbus.co. You have a couple options to get from Cartagena to Palomino. You can get direct transportation from Cartagena to Palomino on buses at the main bus terminal or on the charter service Marsol. You can also get a bus from the terminal or on Marsol or Berlinas to Santa Marta, then catch a bus from the market to Palomino. If you are planning to travel to Palomino from Cartagena, I highly recommend that you also check out the gorgeous mountain town of Minca and Tayrona National Park before or after Palomino. 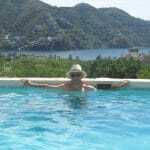 Santa Marta is also worth checking out for a day or two. Can You Fly to Palomino? No. There’s no airport in Palomino. If you want to arrive to Palomino by air, you will have to fly into Cartagena or Santa Marta. You can check out flights into both cities on Colombia’s flagship Avianca airline or compare flight prices across airlines at Jetradar. There are a ton options for places to stay in Palomino. There are hostels around the main strip in town, by the beach, and even some eco-hotels in the surrounding vicinity. You can opt for the budget options of a hammock or tent up to nice private rooms. Prices will vary depending on the accommodations and facilities. Your best bet is probably to scout around once you get there. We stayed at Bikini Hostel our second night and loved it. We had met up with some fellow travelers in Punta Gallinas and the 4 of us stayed in a 6 bed dorm with a private bathroom for 35,000 pesos a person (it was 32,000 for a shared bathroom). The price included a nice little breakfast in the morning. What I liked about Bikini Hostel was the gorgeous little pool, a nice sitting area, and the stylish stairs made out of beer bottles. It is located very centrally, close to lots of the restaurants and bars, and a short walk from the beach. That makes it my top choice for where to stay in Palomino. The sister property to the long established hostel of the same name in Santa Marta, the Dreamer is the only hostel on the beach in Palomino. It is also the most popular hostel in Palomino. That’s not too surprising considering in addition to being on the beach, there is a great pool, pool tables, and a full restaurant and bar. That makes it the perfect place to stay in Palomino. Unfortunately it was all booked up when we visited, so you will definitely want to make reservations here ahead of time. We stayed at Hostel Palomino our first night in town. The property itself is nothing awfully special. However, the prices were good, and it is located just off the main strip in town. Probably most importantly for us, it also had a room available when we got there late in the afternoon! It was 15,000 pesos a person for the 4 of us to stay in a 6 bed dorm with a private bathroom. There were also private rooms as well as tents available on site. The cheaper prices and the central location puts Hostel Palomino at the top of the list of cheapest places to stay in Palomino. Check out other options for where to stay in Palomino on booking.com, hotelscombined.com, hotels.com, and expedia.com. “Downtown” Palomino, a view of the strip where you will find the best places to eat in Palomino. There’s quite a number of places to eat in Palomino along the main strip in town. When we arrived in the afternoon we had a good pizza (super thin crust like Susana loves) at La Frontera. We had great burgers at Juntos Bar and Restaurant that night as well. The second day we had lunch at Su´a Restaurant. We had to wait a bit for our food, but it was clearly because they make all their food super fresh. I had a bomb chicken sandwich, and everyone else had great shrimp. They have a make your own plate where you choose your protein and what kind of sauce you want. The curry, garlic and butter, and coconut, orange and ginger, sauces were all delicious on the shrimp. They also had a great limonada de coco and limonada cerezada. For dinner the second night, we tried Turcolandia Pizzeria. Honestly, it was some of the best pizza I’ve had in Colombia. Thin crust, but with an actual rolled up end crust and loaded with toppings, it was great. There was an arabic restaurant boasting shawarma and falafel as well. If we had eaten another meal, I would have wanted to try it as it looked really good and I’m a big fan of both falafel and shawarma. For the most part the food in Palomino was relatively reasonably priced. Getting pizza, burgers, or falafel is another good reason to visit Palomino if you’re looking for a break from more traditional Colombian fare during your travels on Colombia’s Caribbean coast. There are a number of interesting things to do in Palomino. There is a waterfall a bit out of town named Quebrada Valencia in the mountains. You will need to take a bus or mototaxi to drop you nearby and then hike up to it. We had planned to do this, but we were told it was mostly dried out since there hadn’t been much rain. Probably the most popular activity in Palomino is to tube down the river. You can rent tubes in town with or without a guide, then hike to the jumping off point in the river. You’ll spend about two hours floating down the river before arriving at the beach. Then you will have about a 20 minute walk back to town. >The water on the river is calm and mostly shallow. If you choose to go tubing in Palomino with a guide, they’ll make sure you stay in the shallow areas and avoid getting hung up on any trees. While you lazily float down the river, you can get some beautiful views of the forest. 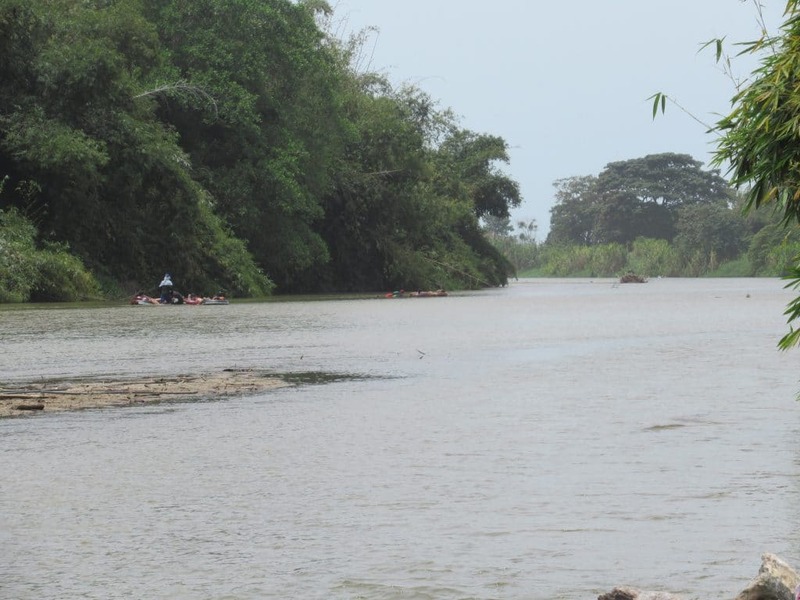 People tubing in Palomino, one of the most popular things to do in Palomino. We did not do the tubing in Palomino, because we had planned on doing Quebrada Valencia. After finding out it was a bad time to visit the falls, the sun was nice and hot, and after spending several days in the desert at Cabo de la Vela and Punta Gallinas, we weren’t up for being out in the sun for the 2 hour float down the river. However, we definitely plan to go tubing in Palomino the next time we visit. I think we would probably try to plan to go early in the morning or later in the afternoon to avoid the sun. We ended up renting bikes for an hour and biking down to the river bank outside town where there’s a nice little swimming hole, and then on to the beach. The path from the river to the beach is narrow and a bit tough on bikes since lots of motos also go by. In the afternoon, we just chilled out by the pool at Bikini Hostel. You can also visit the beach in Palomino. We walked down the beach the afternoon we got there, but didn’t go back the second day. The beach is pretty, but there are better ones in Tayrona, around Santa Marta, or further up La Guajira. The waves did look fairly rough and there were signs posted advising strong currents, so be aware of that if you do decide to go swimming. It seemed like a great place to go surfing, and the beach is a pretty popular after party spot when the bars close. Speaking of partying, part of the reason it has become popular backpacker and hipster traveler town is the vibrant nightlife in Palomino. We got lucky, and the first night we were there, Juntos Bar and Restaurant had a Noche Azul, where they had live music then a DJ (they seem to do it every few weeks). The place got hopping and both the band and DJ were good. I’m sure other places have similar live music and party nights, so you will have the opportunity to get your groove on in Palomino. Also, the beach appeared to be a popular hang out spot at night and as a place for the afterparty when the bars close. The long and pretty beach is another one of the things to see in Palomino. In conclusion, Palomino may not necessarily be a must see if your time is limited along Colombia’s Caribbean coast, but it is definitely worth taking a night or two there to chill out if have the time. It’s especially a good place to relax if you have been roughing it in Tayrona or La Guajira. You can enjoy some luxuries like hanging by the pool at the hostel, getting some gringo grub, and going out dancing while still having easy access to nature. Take cash as there are no ATMs in Palomino. If you run out of cash, you can take a taxi or mototaxi up to the next town, but with only one there, it’s possible it could be out of order. You’re better off taking more cash than you think you’ll need. Budget suggestion: This will depend somewhat on where you are planning to stay, but generally I’d say you’ll be in very good shape planning to spend about 100,000-150,000 pesos a day. Take insect repellent. Remember you’re right next to a river in a small town in the jungle. I recommend OFF! Deep Woods. You can also get the effective Stay Off Amazonic at stores in Colombia. Stick to bottled water as the tap water is not drinkable. If you’re looking to save some pesos and be environmentally friendly, buy large jugs and take along a smaller bottle like this collapsable one from Nomader, perfect for travel. If you decide to go tubing in Palomino, take along a waterproof pouch for your phone. Better yet, check out these great lifeproof phone cases. Or consider this waterproof camera from Olympus or Akaso Action Camera. Be sure to take along sunscreen if you go tubing in Palomino as well. I recommend Coppertone Sport, which holds up well in the water. There you have it, a complete travel guide to Palomino, Colombia. If you do decide to go to Palomino, I hope you find this guide useful in planning your trip. Ready to plan your trip to Palomino? Interested in seeing more of Colombia’s Caribbean coast? Check out our guide to Minca, a gorgeous small mountain town outside Santa Marta about 90 minutes to the south of Palomino that makes for a great break from the heat of the coast. Check our our guide to Tayrona National Park, located just south of Palomino and a great place to spend a few days hiking and camping. Check out our guide to Cabo de la Vela and guide to Punta Gallinas if you’re planning on using Palomino as a stop along the way to La Guajira. This entry was posted in Other Destinations and tagged Caribbean Coast, Other Destinations in Colombia. Bookmark the permalink.